Lovely picture. but so so tragic that shoddy welding from the same team would cost him his life. 😦 RIP Ayrton. Thanks for message but I’m not sure what you’re on about with regard to “welding”. The tyre pressures were low due to the ridiculously slow safety car, he bottomed out over the bump and ran wide on the marbles. If anyone tells you otherwise, they’re dreaming. That race should have been stopped after the start-line accident. Everyone knows that. For full details, read my extensive coverage of the accident in the Sunday Times colour magazine (Feb 16, 1997). Thanks for the picture Peter,I love these black and white motorsport pics, especially of Ayrton. It goes nicely alongside Martin Brundle’s picture of him and Ayrton in F3 on his twitter profile. Thanks – a few more in the archives to be scanned! your posts are starting to get addicting. when a new shows up in my box i either read it immediately or save some part of my day to give it a proper read via my computer. i always forget that you have been involved in F1 for a while. foolishly when you were reporting from pit lane for speed i assumed that was the extent of your involvement. it was not till much later that i discovered that you also work for the teams. was williams one of them? anyway of course you would have a pic like this. please please lets see some more.. Thanks John-Pierre. 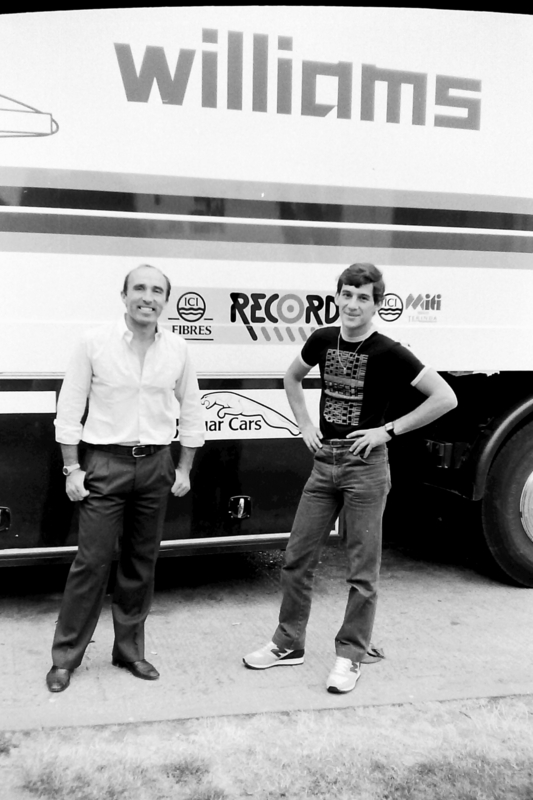 Yes, I helped Frank raise his early Saudi sponsorship in ’78-’81 and then joined Williams full-time in 1985. I then rejoined the team as Race and Test Team Manager in 1991-92. Simpler times, yes: the issues were the same, though. Understeer, oversteer, no traction, not enough budget, etc, etc. I guess the biggest difference is that it was a lot more dangerous then. I mean the steering wheel, sorry I don’t mean to drag up old memories. Ayrton was such a hero of mine, 19 years later and I still miss him every day. Reblogged this on Speed… Stirred. That’s a great snap Peter – love it. A beautiful picture Peter; happy days for both the individuals in the picture. Thanks for posting. I’ve been a massive fan of AS and, even after 19 years, I still think of him every day, as do a lot of others I suspect. Although I guess we’ll never know, I think your analysis of the accident is spot-on and as close as it gets to what happened. Low tyre pressures & ride height, high fuel load at the start of the race, an awkward car being driven by a racing genius on a knife edge at blistering speed to stay ahead of the B194. The evidence of the slow safety car was Senna himself, gesticulating from the FW16 cockpit for the safety car to speed up. Although this is my first post on your site I’m a regular visitor. Everything about your blog is top quality. The stuff on Villeneuve (especially the photos) was exceptional. Hopefully, you’ll be able to commemorate the 20th anniversary of Imola ’94 next year with something special? With huge thanks and my very best regards. Thanks Nick. Nice of you to say that – and, yes, we need to do something at Imola next year, don’t we?